Heat the oven to 350°F. Spray a 2 quart baking dish with cooking spray. Melt the butter in a small skillet over medium heat and sauté the shallots until lightly browned, about 8 minutes. Remove from heat and set aside. 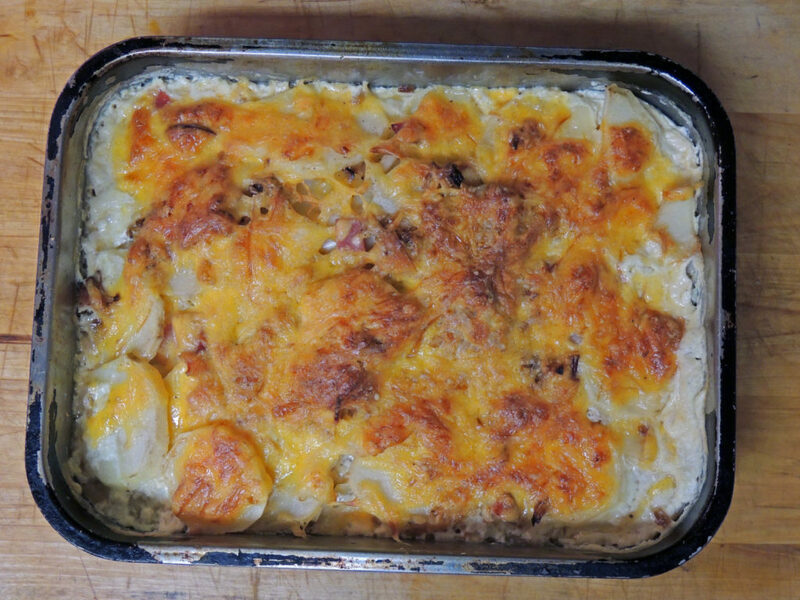 Arrange about 1/3 of the potatoes in the bottom of the gratin dish, overlapping them slightly. Season with salt and pepper. Sprinkle about 1/3 of the ham and shallots over the potatoes and then about 1 cup of the cheese. Repeat this process 2 more times, finishing with 1 cup of the cheese. Gently press down on the casserole. Whisk the half and half together with the flour and drizzle along the sides of the dish. Bake for 1 hour and 15 minutes or until bubbly and browned and the potatoes are tender when pierced with a sharp knife. Let casserole sit for 10 minutes before serving.